Luis Buñuel’s Simon of the Desert is the kind “comedy” which provokes more introspection than laughter. It’s a riot of ideas about faith and organized religion, varying manifestations of greed, and the degradation of the human spirit. 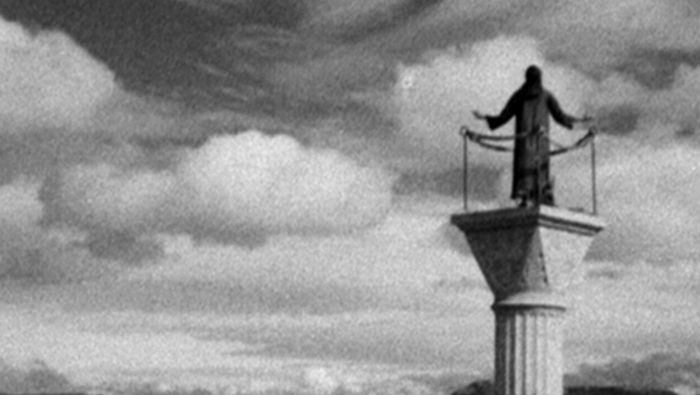 Still, while Buñuel tells the story of Simon — an ascetic who attempts to resist the temptations of Satan while standing atop a pillar in the desert for years — the director does include humorous images and moments of surreal irony (in perhaps the most cited example, a man has his hands miraculously healed by Simon, and promptly uses them to whack his child before shuffling off, ungrateful). The character of Satan, played by the great Silvia Pinal, also takes amusingly anachronistic forms: a sultry tease in a schoolgirl’s outfit, a cartoonish shepherd meant to evince Christ, and in the film’s jarring climax, a New York City partygoer in a miniskirt. While brief glimpses of this type of straightforward humor does exist, Buñuel’s observation of his protagonist and the clergymen who pray at the base of his column is characterized by a more cynical brand of irony. When Simon of the Desert begins, Simon is gifted a larger pillar to climb atop by a wealthy benefactor. We see him move through the crowd toward his new perch, rejecting blessings and spurning the attention of his mother. Simon, by his own admission, is focused on nothing except his own penance and God’s admission. Buñuel seems to be noting that both the benefactor and Simon have made faith transactional — Simon, through rigorous commitment (he had spent 6 years, 6 weeks, and 6 days atop his old pillar) appears to have earned a kind of promotion, while we learn that the benefactor is supplying the new structure to show gratitude for Simon’s past miracles. With his scraggly long hair, forked beard and extreme commitment, Simon is a figure of parody consciously meant to recall Jesus Christ. Yet, Buñuel doesn’t aim to impugn the motivations of Christ or his followers, or question the veracity of their faith — the director’s judgment is reserved for mankind’s impulse to attain dominion over faith in Christ himself. Simon, an aloof and rather dull protagonist, is so consumed by his faith that he nearly drives himself insane as he prays in isolation. He forgets his prayers, and mistakenly blesses a piece of un-chewed lettuce he picks from his teeth (one other instance of effective humor). At such an extreme, his commitment to God seems less like gratitude and more like some thing aspirational and ambitious. Late in the film, Simon converses with a priest about the nature of human greed, betraying a lack of self-awareness: Simon has rejected material possessions, but he is still consumed by greed — for God’s attention, for penance, and for forgiveness. During that conversation, the priest levels what could be a neat summation of the ethos of Simon of the Desert, although the forty-five minute (!) film does defy merely one interpretation. The priest commends Simon’s selflessness, but wonders what it is worth in the context of humankind. This seems to be ultimately Buñuel’s overarching statement. An ardent atheist and famous skeptic of organized religions, Buñuel shows sympathy for Simon, but can’t resist calling the ascetic’s extremes folly. What is being achieved, as Simon decides to stand on not two feet, but one? Who is that helping? The answer, of course, is Simon — and him alone. Notably, Simon doesn’t seem to grasp that his selflessness might be a repackaging of self-centeredness, and Buñuel views his motivations as pure. This makes the film’s resolution, with Satan successfully luring Simon off his pedestal and into a New York City dance hall centuries in the future (or is it Armaggedon?) decidedly cruel. Simon is receiving a comeuppance in the final scene, but not one he quite deserves. 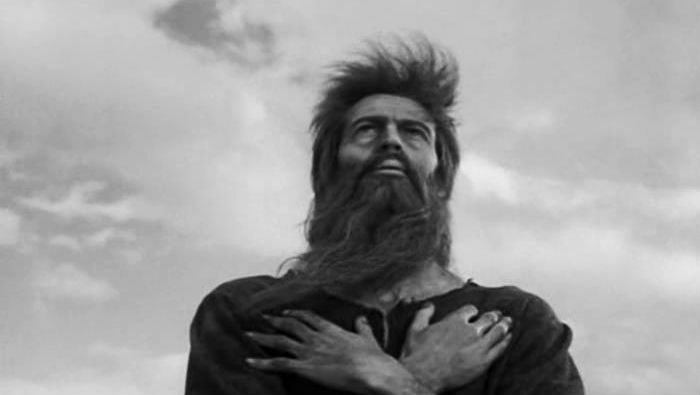 With a closely trimmed beard and fashionable haircut, Simon watches as dancers perform “Radioactive Flesh,” which Satan calls “the final dance.” This, it seems, is Buñuel’s version of the apocalypse, and Simon’s blank expression obscures whether he understands that he did nothing to prevent it. Simon of the Desert arrived as Buñuel was transitioning from Mexico back to Europe, and the film has the distinction of being technically unfinished. At just forty-five minutes, it is certainly truncated, although not at all incomplete. One historical narrative says that Buñuel was forced to stop the filming after his financier ran out of money; another says that this was supposed to be an omnibus effort, with Fellini or Dessin filming subsequent segments. Regardless of its brevity, Buñuel crafted a film rich with tightly packed ideas to parse — and one that looks stunning. Cinematographer Gabriel Figueroa’s sparse black and white compositions shrink the distance between Simon and his audience, placing us in the still and dry desert alongside the ascetic himself. One might wonder whether Buñuel sees Simon in everyone, we who share the voracious appetites and differ only in our interests — people who, given the film’s release at the dawn of the nuclear age, did nothing as we careen toward oblivion.